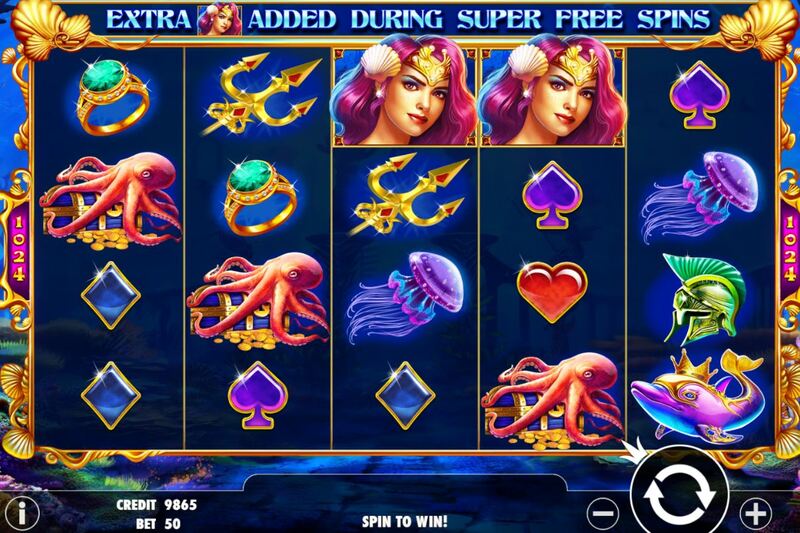 Queen Of Atlantis slot is a 1024way game by relatively new developer Pragmatic Play. We have a mythical underwater theme in which the Queen Of Atlantis is a beautiful mermaid swimming around the lost city and shipwrecks of this fabled undersea ruin. The Queen Of Atlantis herself is stacked 4 rows high and the other symbols appear singly or in twos on any given reel. Wilds occur singly on the middle 3 reels of this 5-reel 4-row slot. You will see a golden trident, octopus, jewellery and helmets along with the card symbols. 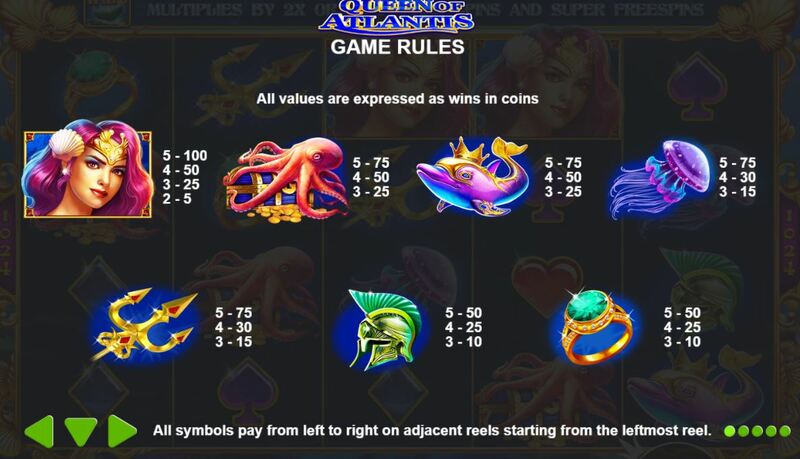 There is even a golden shell with a pearl on all the reels, and the one on reel 5 has a golden pearl which means when you trigger the free spins bonus with 3 of them anywhere in view, if this golden pearl is one of them you get an enhanced free games round! The feature awards 8, 15 or 2 free spins for 3, 4 or 5 respectively whether standard or ‘super’ with the golden pearl scatter involved. There are 5 extra spins for 3, 4 or 5 scatters in standard free spins, or the same retrigger of 8 – 20 if you triggered the super spins. In the standard spins and the super spins any single scatter 1-4 plus the one on 5 awards 5 extra spins. 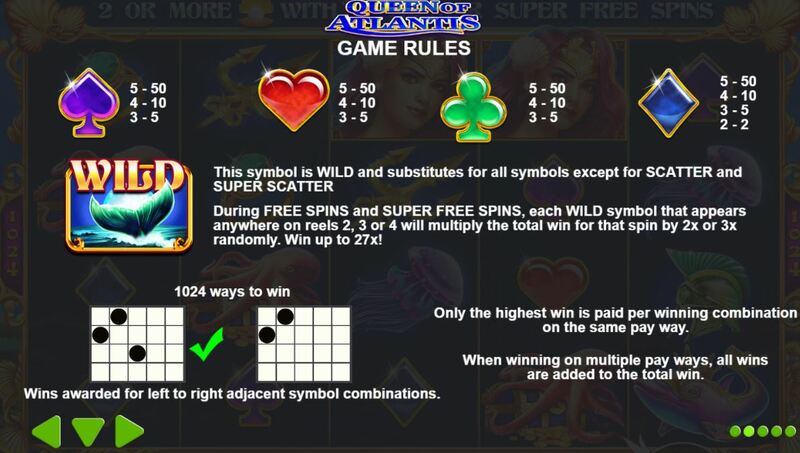 In the super free spins the highest stacked Queen symbol has extra stacks added to the reels and in both types of free spins any Wilds on reels 2, 3 and 4 involved in a win will get a random cumulative multiplier applied thus giving a potential 27x on 4 and 5-reel wins if all Wilds are in view! In the base game any 2 scatters allow a ‘second chance’ pick where you pick from 3 shipwrecks to reveal either nothing, free spins or super free spins of a lesser amount than usual. 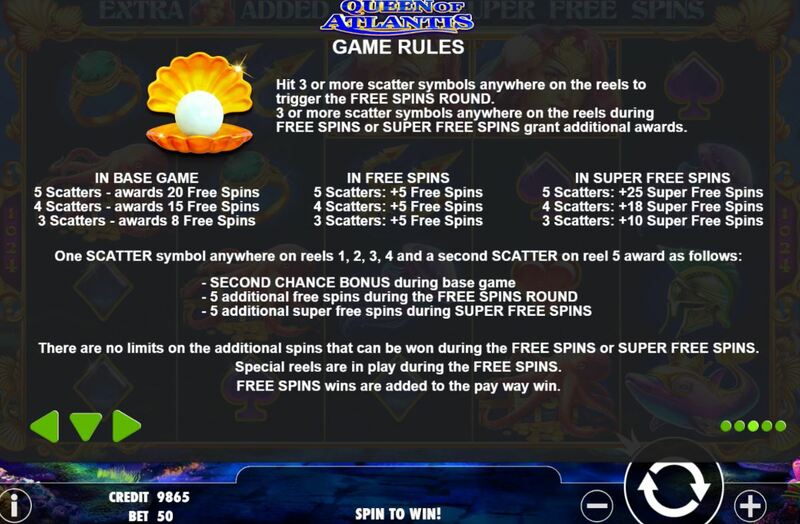 If though the second chance was triggered with the scatter on reel 5 you get nothing, 6 or 10 free spins, if triggered with the super scatter on reel 5 you get either nothing, 7 or 10 super spins. The RTP s a decent 96.41% and the free games with the 2 or 3x Wild multipliers on 2, 3 and 4 are basically modelled on older slots like Aristocrat’s Buffalo or Bally’s Thunderhorn.